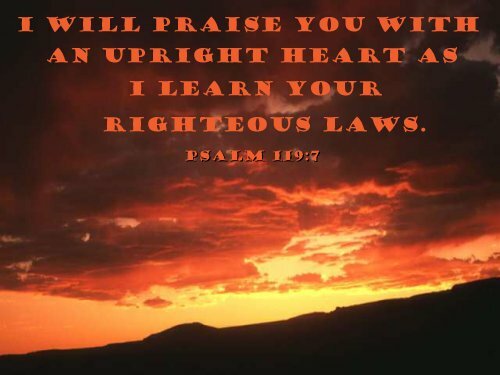 Praise is integrally connected with our character. So for us to worship God, the intent of our hearts and the effort of our lives must show the determined desire to know and live his will. While we will never do this perfectly, grace covers us as we seek to live for his glory. But that grace must never be used as a pretense to excuse spiritual laziness or intentional weakness. Holy God, I want to be more like you in character even though I will never be like you in might or majesty. Open my eyes and through the Spirit enlighten me as I seek your will in your Scriptures and as I seek to be obedient in my daily life. Forgive me of my sin and create a clean and holy heart, wholly determined to do your will. In Jesus' name I pray. Amen.